I’m teaching on Monday evenings at 7pm at the Ballard Health Center, 1138 NW Market, 98107. Join me for Acro Yoga Foundations! Find stability, relaxation, and build the strength to engage with less effort. Explore physical and mental points of contact as we develop the capacity to balance with one another. This class begins with yoga asana, includes strength and inversion training, and culminates in partner flying. No partner or experience is necessary. This is an all-levels practice! Drop-in rate is $14. Packages are available. For more Acro in the Seattle area, check out the calendar at Seattle Acro! 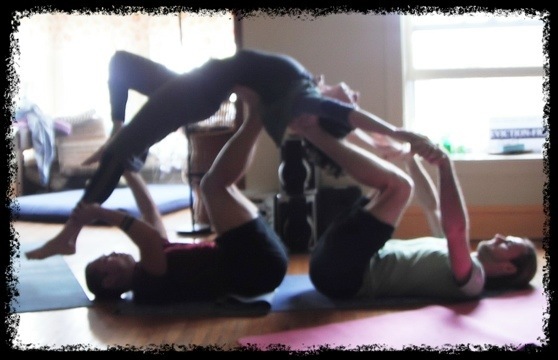 Looking for Acro Yoga in the Chicago area? My old class is still going on: Acro Yoga, All Levels, with Phil Blaetz, The Solarium, 1245 W Jarvis #3, Saturdays, 10:30am. If the weather is nice, they will be at the end of Jarvis by the lake. $10 suggested donation. Find Phil Blaetz on Facebook for more information! You could also try Acrobatic Yoga and Conditioning at Trapeze School New York in Chicago, or see what Wendy Dahl is up to at www.bluesunyoga.com. There are several Facebook groups to keep track of what other classes and jams are happening in Chicago!